in celebration of International Day for the Elimination of Violence Against Women. Similar activities are planned for 2016. Today is International Day for the Elimination of Violence against Women. It marks the beginning of 16 Days of Activism taking place between now and Human Rights Day on December 10th, all over the world. That is true both in Canada and globally. 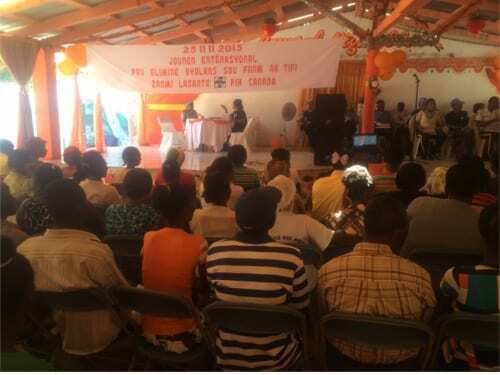 In Haiti, PIH Canada is actively working to correct this injustice with a comprehensive program to treat and prevent gender-based violence (GBV). Since its launch two years ago, the project has provided close to a thousand women and girls with immediate care and treatment following gender-based violence – more than half of those cases being related to sexual assault. Justice and medical colleagues are ensuring proper legal treatment of perpetrators of violence, including the implementation of cross-sectoral GBV surveillance commissions to ensure quick access to justice. Lastly, thousands of community members have been engaged through education and outreach programs to ensure that all efforts are being made to viagra sans ordonnance prevent gender-based violence from occurring in the first place. This time last year, in the lead-up to celebrations in Haiti, we spoke to project coordinator Ermaze Pierre. This year, we will hear from the clients and social workers who have been intimately involved with, and benefited from, the program spearheaded by Zamni Lasante and Partners In Health Canada. Stay tuned for more stories over the next 16 days, and be sure to follow us on Twitter and Facebook for pictures and updates from the celebrations in Haiti. You can support this important work here.